Syd Walker was a favourite of my (late) father, who liked to repeat a (rather naughty) yarn of Syd's involving a small child wetting a bed and of course ending with a "what would you do chums?". More excitement for Lewis Alexander to bristle his moustache at as Pat Gorman gets an extravagant couple of lines to shout, almost as loud as his sweater. The two other golfers at the bar are Ballard Berkeley and Peter Welch. Looks very like a still sprightly Wallace Bosco (centre). Waiting at the door is a pouting Cedric Hardwicke. Naomi Chance as a nurse more interested in doing the tidying up than the health of one of the doctors . . . though it is boring old James Donald, I suppose. Now carefree, Jessie warbles "I'm Looking for You" and looks and finds Cot D'Ordan. A still from the film shows George Zucco at the party, but he doesn't appear in the film. And the listing of David Niven in the film I can't verify as there was no apparent sight of him, although one gentleman with wavy hair looks like him from the back, but not from the front! A still from the film shows George Zucco at the party, but he doesn't appear in the film. And the listing of David Niven in the film I can't verify as there was no apparent sight of him, although one gentleman with wavy hair looks like him from the back, but not from the front! David is only listed on the IMDb as "bit player (uncredited)" so he won't be expected to be in it much, he might be fairly heavily disguised. His first few roles in American films (according to his autobiography) were playing people like Mexican bandits. But he should be recognisable in the film as first released to be listed on the IMDb. This was his first film role (according to the IMDb) so I wouldn't expect much of an appearance, but he should be recognisable to be listed. Maybe his part was cut before the film was released? Congratulations on that early sighting of Naomi Chance, Gerald. White Corridors was a "Viewers' Choice" film on BBC1 about 30 years ago. The channel would ask its daytime audience to select the film they'd most like to see out of the four (?) recommendations. A young Eamonn Holmes was one of the presenters who'd introduce the winner, while eating from a bag of popcorn on at least one occasion. I'm convinced the secretary in Fall High, Fall Hard, right, is Rosemary Dorken. Very distinctive actress. I don't know how we missed her. 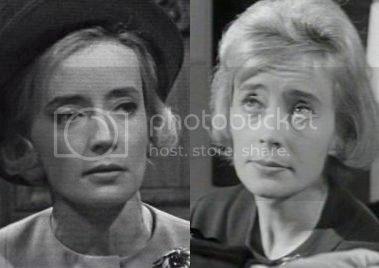 Rosemary did have uncredited parts in the 1963 films The V.I.P.s and The Haunting but would have been a familiar face on TV from Emergency Ward 10. I have some of her episodes on DVD. Like the previously-sighted Michael Graham Cox, she was a guest in Undermind around the time they appeared in Gideon's Way. Last edited by cornershop15; 2nd December 2017, 07:25 PM. Thanks, cornershop. I remember something similar for television programmes in the 60s called STAR CHOICE, where the stars of a series picked their "favourite" episode for Sunday afternoon viewing (in other words, the excuse for a repeat). One I recall was Peter Cushing picking "The Dancing Men" from his SIR ARTHUR CONAN DOYLE'S SHERLOCK HOLMES series. The BBC used the opportunity to show a properly-edited version as the one they had run on its original airing had at least two sequences where the Temporary Fault card had to quickly come up as the AFM had come into shot and said "hold it there . . .", etc. Wresting announcer in the shape of Pat(sy) Hagate. Having all the pleasure at the beach in Blackpool with Hazel Court on candyfloss, Charles Rayford, still in his thin period on the right, with Harold Coyne and Gerry Judge in the background . . .
Douglass Montgomery with a ssurfeit of angsst arrivess and encounterss a cheery Chris Adcock, who appears throughout the film, but narrowly avoids the two places at once trick. Jack May follows behind. That's all in a Blackpool hotel. In the Premier Hotel (sic), London, the receptionist may be a very young Moray Watson. Look who's here, Ronald Shiner spinning his wares tale, with Rex Garner on the right heading off to resume his waiter job . . .
Also fairly startling is the youthfulness of Blackpool bobby John Adams. Managing to get into the key light is this onlooker. Good move as it appears to be a very young Harry Van Engel. In addition, in a theatre scene, the Lon Chaney, Jr. lookalike turns up as a stagehand and it sounds like the voice of E. V. H. Emmett coming from a radio in a scene in a café operated by Andreas Malandrinos. 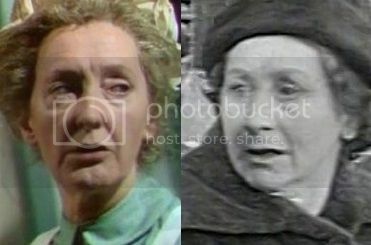 Could this be Hyma Beckley in the Muppets Christmas Carol? Bud Flanagan catches Peter Hammond as a cub reporter behaving inappropriately. Reflect, Peter, reflect! The stitching leads to Court No. 1 where Judge Frederick Kelsey isn't taking the case. Frederick gets a line to say and then turns up moments later as a gowned lawyer in Court No. 3.